And that’s about it. While many of you are now thinking “Awesome, finally!,” we suspect some may be wondering why you’d put your merch up on Bandcamp. There is, after all, a 10% revenue share, and perhaps you’ve got your merch on another storefront already. The simple answer is that you’ll earn more money. Here’s why. I already have a bunch of posters, buttons, and t-shirts on my album pages. What should I do? They’re already on your merch page too. You can leave them on your album page, or you can remove them by editing the album and clicking “detach” next to the merch item. I’m one of the people who made one-track albums for my posters and t-shirts, what should I do? Double-check that the item is on your merch page, and go ahead and delete the album. How does this work for music-related merch, like vinyl, CDs and cassettes? We automatically show your vinyl, CDs and other music merch on both your merch page and the page of their associated albums. 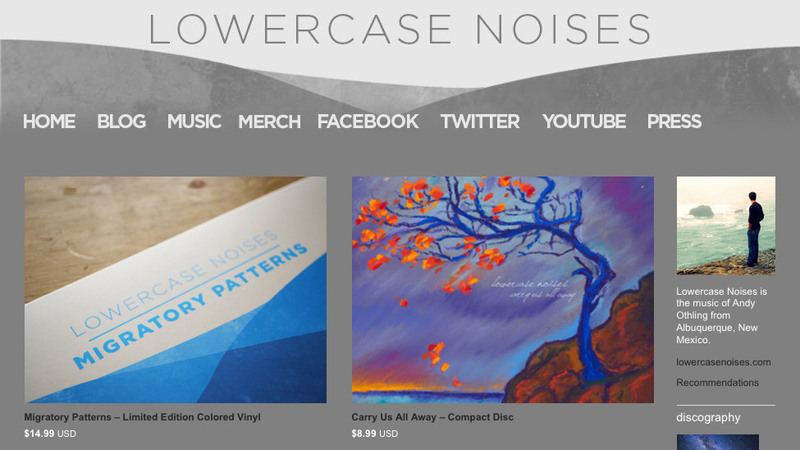 If someone clicks your vinyl from the merch page, that will take them right to its album page. I don’t see my merch section. That means that you either don’t have any merch yet, or that all your merch is music-related (e.g., vinyl, CD, etc.) and on a single album (in which case we display it on that album’s page). We can do no better than The Oatmeal. Thanks, be sure to check out your Bandcamp site, verify that everything is dialed in how you like it, and drop us a note in the comments if you have any questions. This entry was written by Ethan Diamond, posted on August 1, 2012 at 3:20 pm, filed under Bandcamp. Bookmark the permalink. Follow any comments here with the RSS feed for this post. Comments are closed, but you can leave a trackback: Trackback URL. Hi guys, love the merch section BUT is there a way now or in the future that will allow us to DUPLICATE a merch entry so if we want to make variations on similar items with different prices, add ons, etc, that we can just essentially copy+paste an existing merch entry and slightly adjust as opposed to entering it ALL again. OR perhaps introduce greater control in the merch section that allows for price variations, post options like express and tracking prices. Thanks. Keep being awesome. I agree with Alun Vauggan & michaelkostal, downloadable merch (like PDFs of sheet music) would be wonderful! It would also be great to make the album download optional even if the merch is linked to the album. Yes indeed John, coming soon. Will Merch be appearing in the Facebook app any time soon?? Just in time! I was thinking of how to giveaway free downloads with merch purchase for an upcoming mixtape project, and BOOM! Bandcamp leads the way. Thanks guys! Good idea, will add to the to-do. Hey guys, this is excellent. I have a shirt, it’s just my generic “band” shirt… I would really like to include an album download with the shirt, with one hitch: I’d like them to be able to choose which album they get…. any plans to make this possible? I think it would be cool to have ability to embed video on bandcamp. I don’t know… maybe you thought of it already… it just seems that it might make the page a little more “sticky”. But at any rate, I love your new enhancements! Thanks a lot! Sorry about that, the 5-option limit was a mistake, that’s fixed now. No ETA just yet, but yep, that’s the plan Dennis. Will you be allowing us to add more (custom) links to the nav bar? Hey Chris, you can customize the link text by choosing “edit navigation bar” over on the right. If you’re talking about also changing the “/merch” portion of the url, that’s not possible, but something we’ll consider. This is AWESOME guys, kudos! PLEASE PLEASE PLEASE. Can you allow us to customize the name from “Merch”. I HATE that term and it makes everyone sound like a cookie cutter heavy metal band. Even so, this is radical. Thanks you. Hi Scott, you can work around that restriction by choosing “Other” from the “What is it?” dropdown in the merch editor. Unfortunately we have two albums that we can only sell on CD due to rights issues. But the Merch section does not allow me to add a CD without tying it to an already existing downloadable digital album. Any chance this restriction could be lifted? Great addition to what already is a great service for us musicians. Hi Nadav, the way most artists do it is by making options like “Black/Large,” “Black/Medium,” “White/Large,” “White/Medium,” and so on. It takes a few more minutes to set up, but it keeps the UI super simple for fans, and also avoids some complex inventory issues for you. Great! One question though – can’t I add more than one option field? For instance, so that Option #1 would be “shirt size” and Option #2 would be “color”? The music/index section is definitely due for an update, it’s on the list! So now that you offer a drag and drop feature in the merchandise storefront when will you offer a similar feature in the music storefront? > If you have a private album with Merch associated with it, that merch is now public. Thanks for catching that Robert, it’s now fixed. We’re not quite following your second point, will follow up via email. 1) If you have a private album with Merch associated with it, that merch is now public. 2) Merch you want associated with a download of a private album… Private or Draft albums are not available from the drop down to choose from. That said, you can’t update the merch settings to Private since you can’t select the corresponding Album (I suppose you could pick something at random, but that’s not a fix). Thanks Bandcamp, been waiting for something like this! As always, your dedication to excellence and awesomeness makes me a happy musician! Thank you! Thank you, thank you, thank you! This is exactly what I was waiting for. > will we still have to send it ourselves when an order is placed? we can help with fulfillment, please email shipping@bandcamp.com. This is great news! The checkout process on some other sites is an absolute nightmare. Just wanted to ask though – does this mean that Bandcamp will actually produce the merch to order, or will we still have to send it ourselves when an order is placed? This looks so cool! Thank you bandcamp for constantly improving something that is already great. Now I only need to come up with some ideas for merch to offer besides my CD. Oh, Bandcamp, you are amazing. Even the new nav bar is customisable and integrable with our custom headers. I just… love you. Looking forward to getting stuck in to customising this properly over the next few days.